You know what I love? Christmas. You know what one of my favourite things about Christmas is? Revisiting the same traditions year after year as the boys get older and watching them reinterpret the traditions for whatever age they are at. It’s been nearly a decade since we discovered the Portable North Pole (PNP), and it has become one of the Christmas traditions my kids love best. Even now that they’re teenagers (sidebar: what? when did that happen?) they still watch their annual video message from Santa, and Lucas has already started speculating about when his video might arrive. Truth be told, I credit the Portable North Pole for keeping the magic alive – I’m sure my kids accepted Santa as real for years in no small part thanks to the arrival of their personalized video messages each year. I have loved watching their faces as they watch the videos! So what is the Portable North Pole? At its core, it’s a wonderful little site where you can upload a few photos and select a few options and make a customized video letter from Santa for your child. There’s just enough details in the video that it truly seems that Santa has been keeping track of who has been naughty and who has been nice, and it’s all rolled together in a cute little storyline. The options change from year to year, so even after nearly a decade, the kids have never received the same video twice. And, since the kids always watch each others’ videos, I’m delighted that there are always at least three unique videos to choose from each year, so they are truly personalized for each kid. They have added lots of other fun activities through the years on the PNP site. Now in addition to the personalized video letters from Santa, you can get bedtime stories from Santa and birthday wishes from Santa. There’s an app, and fun and games on the Santa’s Village microsite, and your kiddies can even get a telephone call from Santa. And, in a touch that I think is lovely, 5% of all funds collected through the sale of magic passes is donated to childrens’ hospitals around the world. 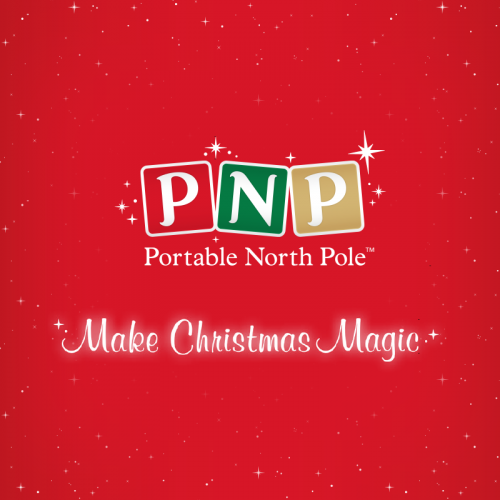 IMHO, though, the real magic of the Portable North Pole is the video messages. For Black Friday (now through November 27) use THIS LINK and coupon code PNP7BFD to save 30% off a Magic Pass. If you’re seeing this after November 27, feel free to use discount code PNP7BLG20 to save 20% when you purchase a video pass or a magic pass. (Here’s an article that explains the difference between the video pass and the magic pass.) There are also a small selection of free videos available. There’s a little something for everyone! If you do use the coupon codes, be sure to come back and let me know if your kids loved it as much as my boys do! FWIW, the Portable North Pole is still my favourite, and NORAD’s Santa Tracker a close second. As far as I know, the magic of Christmas is intact in the imaginations of my offspring, and I credit the videos from PNP (and perhaps an unwillingness to jinx the appearance of presents on Christmas morning?) with their utter lack of skepticism. Because they were so charmed by the PNP (and have even started wondering when their videos will ‘arrive’ this year in Mom’s inbox), I think they’ll be equally delighted with this: you can now make an appointment to Skype with Santa. How cute is that? 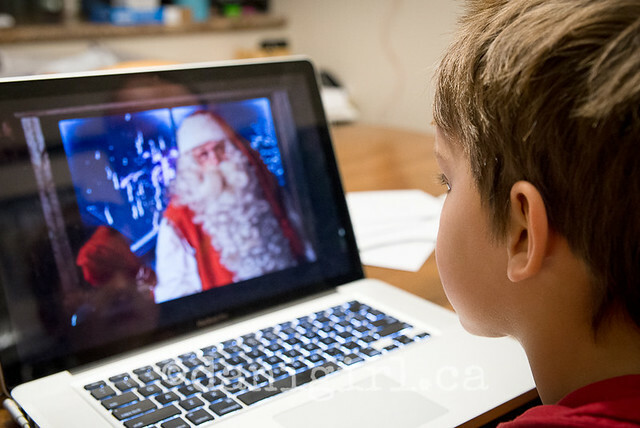 You can reserve your child’s 10 minute Skype with Santa courtesy of the Toronto Eaton Centre now through December 23. Although I’ve used Facetime, I am embarrassed to admit that this social media maven has never actually used Skype. Like making a Blurb book, this is another thing I’ve been meaning to conquer but never seemed to get around to, so it will be good practice. Feel free to share Skype tips! Hmmm, something’s just not quite right. The tree is up, the stockings are hung, the malls are filled with frantic holiday shoppers and Magic 100 has switched to all-Christmas-music-all-the-time format. I’ve blogged about Santa parades and the Portable North Pole. I’ve got all my bloggy holiday traditions covered, but it feels like something is missing. Oh riiiiiiiight. It’s time for the annual reindeer rant! 🙂 If I can educate one misinformed soul every year about the correct names of Santa’s reindeer, my mission will be a success. As you might know, my last name is Donders. As such, it has been my lifelong quest to set the record straight and right the wrongs entrenched by Johnny Marks and Gene Autry. On, Comet! on, Cupid! on Dunder and Blixem! 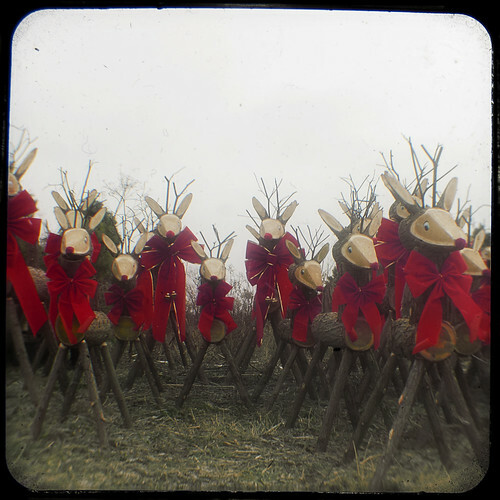 In the original publication of “A Visit from St. Nicholas” in 1823 in the Troy Sentinel, “Dunder and Blixem” are listed as the last two reindeer. These are very close to the Dutch words for thunder and lightning, “Donder and Bliksem”. Blixem is an alternative spelling for Bliksem, but Dunder is not an alternative spelling for Donder. It is likely that the word “Dunder” was a misprint. Blitzen’s true name, then, might actually have been “Bliksem”. We were successful. In fact, Library of Congress reference librarian David Kresh described Donner/Donder as “a fairly open-and-shut case.” As we marshaled the evidence near Alcove 7 in the Library’s Main Reading Room a few days ago, it quickly became clear that Clement Clarke Moore, author of “A Visit from St. Nicholas,” wanted to call him (or her?) “Donder.” Never mind that editors didn’t always cooperate. […] Further confirmation came quickly. In “The Annotated Night Before Christmas,” which discusses the poem in an elegantly illustrated modern presentation, editor Martin Gardner notes that the “Troy Sentinel” used “Dunder”, but dismisses this as a typo. Gardner cites the 1844 spelling as definitive, but also found that Moore wrote “Donder” in a longhand rendering of the poem penned the year before he died: “That pretty well sews it up,” concluded Kresh. So there you have it. This Christmas season, make sure you give proper credit to Santa’s seventh reindeer. On DONDER and Blitzen. It’s a matter of family pride. This post was inspired by a CBC article about how Shaw Cable moved its beloved Yule Log channel to a Video On Demand channel. The previously free stream featuring nothing but a Yule log burning in a fireplace, now entering its 25th year, will now cost 99 cents. The fee, plus a matching amount from Shaw, will be donated to charity. Thanks to the Twitter conversation about the change to Shaw’s Yule log channel, I discovered that of course there’s an app for that. And then I fell down the rabbit hole of iPhone Christmas apps. 1. The Yule Log app. As soothing and oddly compelling as Log itself. 2. Christmas Music by Nutsie. Thousands of Christmas songs wrapped up in dozens of playlists like Top 100 Christmas Songs, Children’s Christmas, Krazy Kristmas, and (I’m so curious, I may just have to fork out the $1.99 for this one) the Jingle Bells Playlist. 3. Postcards from Santa. This one is getting such great reviews that I think I might have to try it myself! “Select from a number of charming santa images, use our pre-written santa message or write your own, and enter the name and mailing address of the child you want to send the postcard to. We will print the customized postcard and drop it in the mail. Your child’s postcard will arrive only a few days later in the mail.” Fun! And, for those of you who don’t have an iPhone or an iPad, here’s four more 21st Century Christmas sites and services! Along the same lines, Sympatico’s Magic Santa is an online video service you can use to make free personalized videos messages from Santa for your kids. Sympatico.ca is partnering with Kids Help Phone and will be giving $0.25 to them for every video made up to $50,000. There’s also is a contest… one family will win a trip to Walt Disney World by capturing a photo or video of a child’s reaction to a Magic Santa video and submitting it to the contest site by December 19, 2010. And there’s even a Magic Santa iPhone app. The NORAD Santa Tracker site has been around for awhile, but now there’s a mobile version, too! This Christmas eve, join NORAD to track Santa’s flight from your phone. On December 24th, open Google Maps for mobile and do a search for “Santa” to see his latest location. And of course, you can always follow Santa on Twitter! Completely serendipitously, just as I was finishing this post, my brother e-mailed me this amazing video of a Christmas concert staged entirely with iPhones and iPads. As my brother said, how could you NOT want an iPhone or an iPad after you see this? We’ve come a long way from letters the editor, haven’t we Virginia? Back in the day, the only ways you could “interact” with Santa were to stand in line at the mall to sit on his knee, or maybe at your parents’ annual company Christmas party. Now that we live in an interactive world, though, not only can your kids write a letter to Santa, or listen to Christmas Eve updates of his whereabouts from the local weather man, but you can get e-mails, videos and track the big dude yourself starting early in December. Here are five fun ways for kids to communicate with Santa, starting with my fave. 1. The Portable North Pole. I love this app, madly and deeply. Whomever came up with this and put it together is brilliant. I did this last year and the look on the boys’ faces was priceless — and though I haven’t been all the way through it this year, I can see they’ve made even more improvements and personalization. You the parent have to go in ahead of time and set it up, supplying your kids’ first names, something they’ve done that’s good, a photo if you like, and other personalized details. They give you a link to a video, and you can visit it later with your kids. I must remember to go in tonight to set up all three boys, so they’ll know Santa is thinking about them! In 1997, Canadian Major Jamie Robertson took over the program and expanded it to the Web where corporation-donated services have given the tradition global accessibility. In 2004, NORAD received more than 35,000 e-mails, 55,000 calls and 912 million hits on the Santa-tracking website from 181 countries. The site now gets well over 1 billion hits. 4. Friend Santa’s on Facebook Last year, there was a kerfuffle online when Facebook refused to let Santa have more than 5000 friends but the Norad Tracks Santa page has more than 37,000 fans. And if you’re in it for the presents, the I Believe In Santa Claus group has more than 150,000 fans and seems to have regular giveaways.